I have a bit of a confession to make. Or, well, to reiterate. Several of my articles for the SixTAY Days of Writing challenge were written when I was, to put it politely, wasted out of my mind. I admitted this in the tags of a few of these articles, but I’m under the impression that no one reads the article tags. So here is my official confession. In addition to writing a few articles drunk, I have also been engaging in a bit of gaming while under the influence of alcohol. I wrote about this before, but my drinking habits have been a bit different of late. I’ve been drinking and gaming… by myself. Now, generally drinking alone is frowned upon. It is often seen as an unhealthy habit, and can be an early sign of alcoholism. The people that are most concerned by solo drinkers, though, tend to be those that value socialization above all else. These people cannot fathom the idea of enjoying a few beers by themselves, either because they have bought into the social stigmas surrounding the concept or they are terrified of being alone. Either way, they are largely wrong. Drinking alone can be a great experience in moderation (like all forms of drinking). As I get older, I have found myself becoming more cynical and unforgiving when I play a game. This is a good thing to a certain degree, but sometimes it can ruin what could be at least a mindlessly enjoyable experience. Alcohol removes that analytical pressure, and allows me to get away from the complexities of my own mind for a bit. 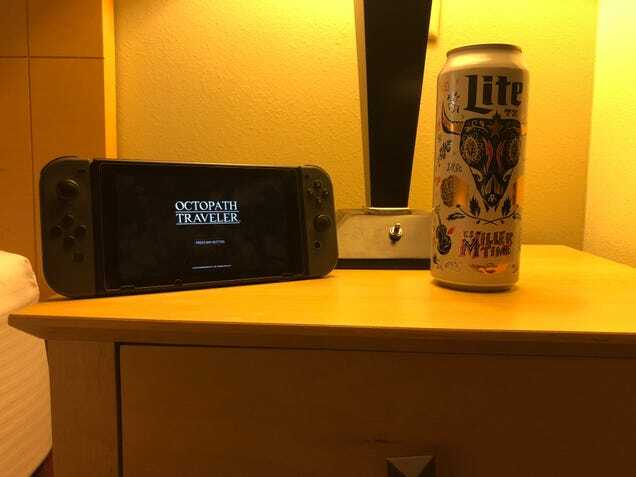 For example, tonight I finally started getting into Octopath Traveler. I started with Ophilia’s story, and while I found it fairly engaging, the voice acting is… subpar. To say the least. Since I also decided to celebrate my difficult work trip coming to a close with a couple of drinks though, I just found myself laughing at how incompetent Ophilia’s sister’s voice actress was. She didn’t seem to grasp the concept of emphasis, so many of her lines sounded like an alien trying to imitate human speech. The sounds were right, but nothing about it felt natural. I found this hilarious. Little annoyances like that melt away in the calming embrace of an alcoholic buzz. Once again, I will remind everyone that alcohol should be a sometimes thing. It should by no means be used as a regular escape from difficult situations, challenging decisions, or general hardships. On occasion though, it can be used to help you see some things in a different light. And while I don’t anticipate the need for alcohol during my entire playthrough of Octopath Traveler, it certainly helped break the ice.